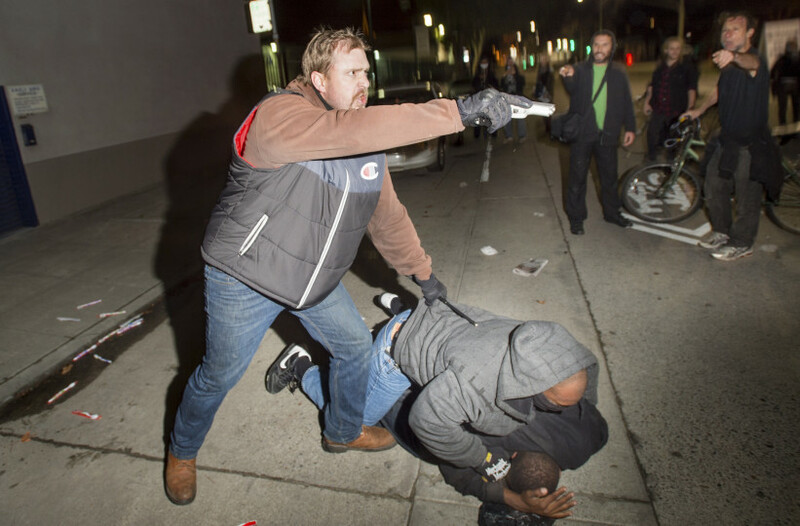 An undercover police officer, who had been marching with anti-police demonstrators, aims his gun at protesters after some in the crowd attacked him and his partner in Oakland, California, December 10, 2014. 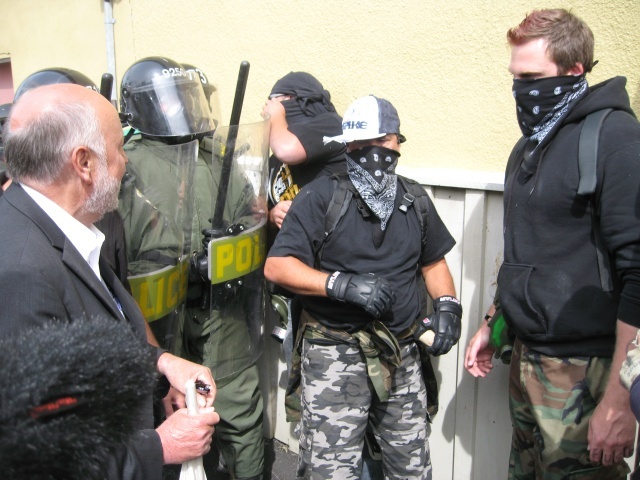 Undercover cops from the Surete du Quebec confronted at protest in Montebello, Quebec, August 2007. These cops were first challenged by masked militants who became suspicious, and then a union organizer began to confront them. 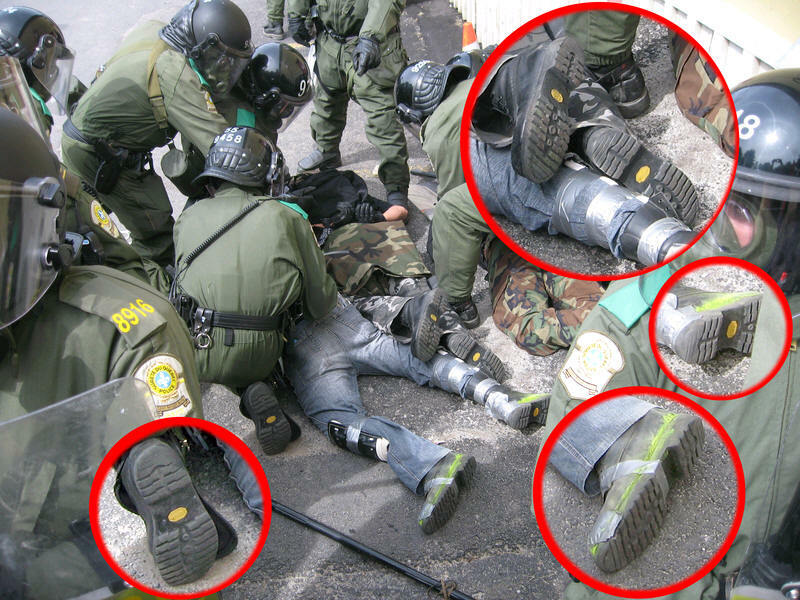 Photos showing the undercover cops wearing the same boots as the riot cops “arresting” them, Montebello, Quebec, August 2007. 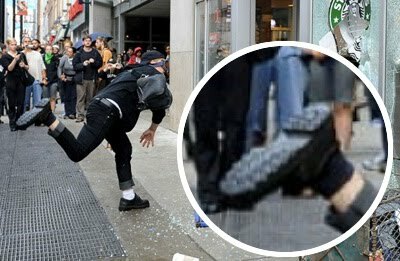 After the Black Bloc actions at the Toronto G20 in June 2010, conspiracy theorists tried using the same “undercover cops wearing cop shoes” as “evidence” that masked militants were also cops… without any evidence other than their theories about what types of shoes cops wear. Pathetic. Posted on May 15, 2015, in State Security Forces and tagged agents provocateurs, conspiracy theories, militant actions, police infiltrators, police provocateurs, undercover police. Bookmark the permalink. 5 Comments. Activists, Advocates, Defenders, Protectors, and ‘Protesters’ notice the behavior of an Infiltrating undercover by their verbal and physical actions. Hi Y’all ! I realise that ‘Warrior’ only posts this info, but I would like to get incontact with ‘ZigZag’ and ask her/him about what to do ! I am in UK and ‘we’ have had several N. Americans fm USA,come over here and cause havoc in the activist scene ! One such person , HH, is either an undercover CIA, a Manchurian candidate persona or a sociopath. He made it his ‘thing’ to search out what he called ‘nodes’ or alpha persnalities/’doers’ and in his theory, he would link them all up in a meeting and then create an International conspiracy ! What he achieved has been documented in the Rolling Stone & Les InRock mags. But it was HH who called the meetings and sought out the ‘players’, people only he knew but who were doing positive actions in their own .To make a long story shorter HH brough Mark Stone/Kennedy (UK undercover police) to NYC to meetings. Countries that were affected by this were Denmark (COP15), Germany (G8). Japan (G8). France (Tarnac7), UK, Italy & Greece. The overall plan seems to have been that HH would ‘stir things up’ connecting his ‘node theory’ (which he wrote up in Turbulence) would & his good friend DG would write the book ! In fact the latter ‘s first book was about an afinity group that he infiltrated and supposedly (accordingly to those quoted in the book) recorded the direct action meetings and published it with their activist names ! So the question is …..how does one deal with such betrayals and how is one to know for sure if they are agents of the state , sociopaths or ‘sleepers’ ? Needless to say all the innocent people involved are now on the security database, Interpol,MI5, FBI & other shite lists ! They aren’t difficult to spot, you just need to be actively looking. Of course, who has got time for that? Appointed security does. It’s important to have internal observers during every protest as well as a camera team. Recording the events leaves much of rumor and assumption behind.